Each dot is a person. Yellow = slight injury, pink = serious, red = fatality. 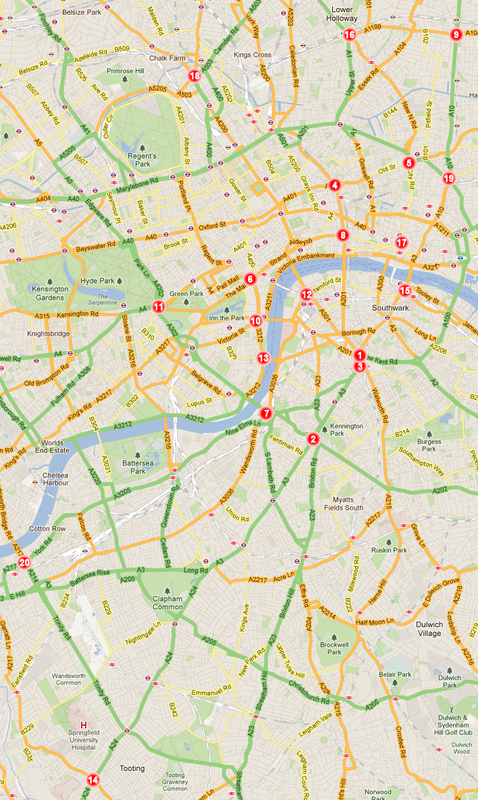 Pictured left is every single collision with a person on a bike in and around the City of London from 2005-2010. Yellow dots are slight injuries, pink are serious injuries and red are deaths. The map is courtesy of Levenes, cycling injury lawyer folk and you can drill down into any part of Great Britain here. I think what shocked me was the actual number of incidents on each stretch. Taking my favourite bridge, for example, 14 collisions on Blackfriars Bridge. But then 31 collisions at the junction at the northern end of it, 38 in the 200 metres or so between that junction and the next one at Ludgate Circus, 56 just up the road at the crossing with Clerkenwell Road. 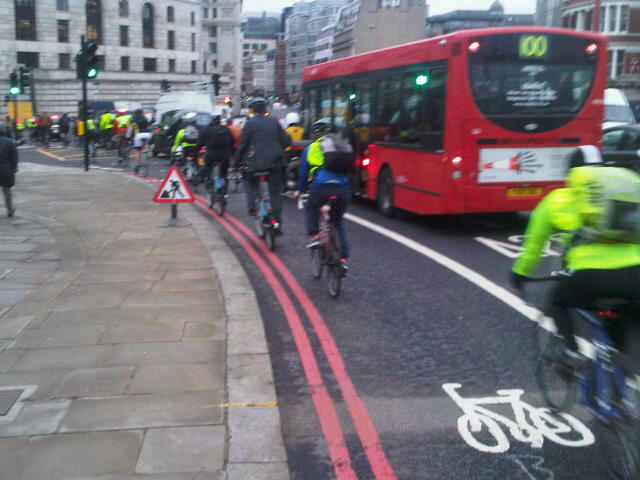 If you cycle from Southwark tube station to Clerkenwell Road in a straight line over the Bridge and up Blackfriars Road, you'll pass 201 collisions with cyclists on that 1.3mile stretch, so around 31 collisions per mile per year. Head from Old Street to Red Lion Square at Holborn (1.5 miles) and you have 33 collisions with people on bikes per year. Seems to me like 30+ collisions per mile per year is the going average, or one every 11-12 days. 20 people in motor vehicles. Guess who has priority? But I reckon that under-represents the actual issue. I know that I've had people drive into me on my bike and never bothered to report those incidents even if one involved a hospital trip the next morning. I've reported one such collision but not reported two others. I don't know if that's representative or not but it indicates the problem may be significantly bigger than these maps suggest. 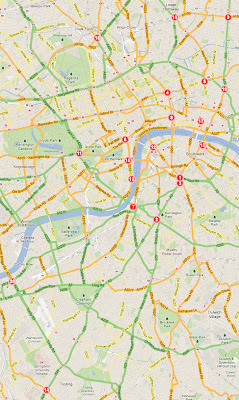 Earlier today, The Times launched its own #cyclesafe map which you can see here. What's important about this particular map is that the results may be used as evidence in a parliamentary Transport Committee, in essence a parliamentary inquiry into safer cycling, to take place next month. I assume in England only, given these matters are handled by national governments in Scotland and Wales and devolved the Mayor of London in the capital. Within hours, there were over 1,000 points on the map. I'd encourage you to add your own danger points. What strikes me is that there is no such things as a just one danger spot, though. When I cycle up Blackfriars Road, I can think of three really dangerous elements in the road design within about 50 metres. These are things you'd only find dangerous on a bike and probably wouldn't notice if you were driving a car (incredibly narrow bike lane; pavement newly changed so it juts out at a bus stop, forcing you into main traffic flow; bus lane so rutted you have to weave around the potholes rather than stick to a straight line). I suppose my point is that it's not really about one danger spot or another, it's about how we design our streets and how our road culture functions. The Times also points out that the Department of Transport has held a preliminary meeting 'to devise a national plan to promote safer cycling'. I have to hope that the emphasis will not be entirely on the responsibility of the cyclists to cycle 'safely' and that the DfT realises it has a big role to play. At its simplest, things like the fact that traffic wardens aren't able to ticket people for parking in mandatory bike lanes. My own view is that Department needs to show councils and the Highways Agency that it is serious about cycling and that it will put its money where its mouth is. The Department for Transport announced a number of schemes today to encourage cycling to stations. The total sum announced was £15million. There are some very worthy schemes in here, although I notice very few of them involve proper safe infrastructure for people to cycle along. Just to put that in context, a town I'm fairly familar with in North Yorkshire is petitioning the DfT for a bypass. It's not a particularly busy town. By south-east of England standards, the traffic is incredibly light. That one bypass is going to cost £42million. So, £42 million for one bypass that is at-best almost pointless versus £15 million for some bike parking and literally a handful of bike routes. Don't get me wrong, the bike routes are great. My point is the money is hardly meaningful in context. As Maria Eagle, the Shadow transport secretary pointed out on twitter today: 'Government's £15m one-off cycle fund only restores a fraction of the £60m annual support lost when Cycling England was stupidly abolished'. I think the good news is that things are moving. The DfT meeting was the first of two. And the opposition is doing its job. It is putting pressure on the government to think about cycling. But I have to hope The Times is right when it comments that it "understands that the [Department for Transport's] plan will consider ways of building better infrastructure, improving the behaviour of cyclists and drivers, reducing the speed of motor vehicles and better law enforcement on the roads. Signatories hope that it will be put into action within weeks." All of these things are needed. And bragging about £15million for cycling infrastructure (only a fraction of which will actually go on infrastructure) is peanuts in the context of what's needed. Very interesting point about there being 30 collisions per mile per year. You’re right these are only the ones that are reported. Sadly cyclists often think that when they are hit they don’t have as many rights, or cannot kick up a fuss about it as you would if you were in a car, or on foot. Or even if they are injured, it was probably their own fault! Too often we hear of cars that don’t stop, or just abuse the cyclists they’ve just hit. If we can help contribute to the change in attitude that seems to be picking up pace recently, that the roads are for all of us and that Cyclists especially, have as much right to use the roads as the motorised users. We’ll be glad to play our part. I always feel guilty when I don't report a collision (even if the car driver disappeared before I could get any details). This is tempered somewhat by the realisation that not only would reporting prevent me from getting to work / going home and getting any sleep, but I probably wouldn't even get to the nearest police station without another car driver doing something illegal and insanely dangerous. Unfortunately I speak from personal experience, and cannot afford to stay at police stations until midnight every night when all I wanted to do was ride home from work (9-5 job). You can report crime online nowadays, so it shouldn't take that long. I have been left-hooked three times on Blackfriars Bridge, just by the lights where traffic turns down onto the Victoria Embankment. All three were black cabs. All three, as far as I can tell, were red-light-runners - racing through to just catch the lights on green, overtaking me and turning immediately left across my path. All three were also hit & runs. The last one stopped briefly, looked back at me and concluded I wasn't dead, and drove away. Unfortunately neither I nor any of the dozen or so witnesses had the presence of mind to get his licence number - remember that the Hackney Carriage licence is specific to the driver, not the vehicle. I did report this online, but much good did it do me. Two years on, I have had two operations and months of physio, and spent a ton of money when the BUPA cover ran out. I only hope that next time I will manage to get the licence plate, and I will unquestionably commence proceedings, because the injuries don't always manifest straight away. I always offer to be a witness if I think I have seen anything at all, but on the handful of occasions I have been declined, the victim basically saying "what's the point?" A great map, I particularly like the cluster facility. What I get from this is: Avoid busy roads, use back-roads where possible, be particularly careful at junctions. The casualties of war. This is all road casualties by type: 2000-2010 Stats 19 data. Toyota Previa is a Rear-wheel drive besides this all-wheel drive version in Toyota Previa is available. The Toyota Previa's spaceship-like interior is roomy and comfortable. Fit and finish is very good. Driver's place is comfortable; great visibility. The third-row bench seat splits in half and folds up easily against the sidewalls making a lot of space for cargo.